The theme comes with 7 pre-designed & built homepages for you to use, or edit to make a little more your own. We’ve included Visual Composer for free so you can quickly and easily build your own pages to make the theme more custom to your business. Why not try giving healthy cooking a try, check out our recipes section that’s full of delicious and easy to make dishes to help you live a healthier life. 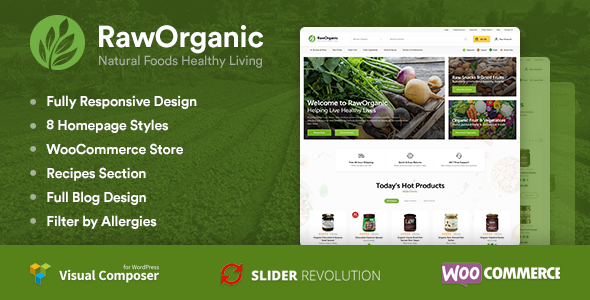 RawOrganic comes with comprehensive documentation and theme support so you can buy this theme with confidence knowing you’ve a professional team ready to help answer your questions.